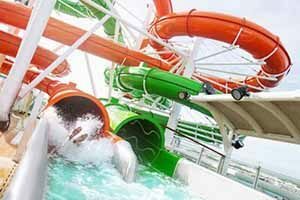 Royal Caribbean’s blog has revealed that the cruise line is to add water slides, an aqua park and its popular Izumi Asian restaurant to Adventure of the Seas during the ship’s November dry dock. The culinary additions will require an extra charge. Liberty of the Seas, Jewel of the Seas, Majesty of the Seas and Empress of the Seas have all completed dry dock refurbishments in 2016.